Butyl rubber’s most outstanding characteristics are its low permeability to air, gases, and moisture; vibration damping; low glass transition temperature; low-modulus and low compression set; resistance to aging and weathering; wide vulcanization versatility; fast cure rates; and good adhesion to and compatibility with other rubbers. Some of butyl rubber’s disadvantages are low resilience, only fair physical strength, and limited resistance to hydrocarbon solvents. In the case of vibration damping, it is not the first choice because it is too expensive compared with natural rubber. It is good for body mounts and suspension bumpers. A major disadvantage of nonhalogenated butyl rubber is its inability to be blended and vulcanized with highly unsaturated elastomers such as styrene-butadiene rubber (SBR), polybutadiene, and natural rubber; as a result, the majority of butyl rubber consumption is for halogenated products. Tires, tubes, and tire products remain the major end uses for butyl elastomers and are estimated to account for about 80– 85% of total consumption. The remainder is consumed in the production of adhesives and sealants, pharmaceutical products, automotive mechanical goods, and other end uses. This is not likely to change in the future, as the tire industries, especially in the developing regions, remain the main driver behind global butyl elastomer consumption growth. Northeast Asia overtook North America as the largest producing region in the world in 2016; in 2017 the region accounted for about 32% of the total capacity, followed by North America with 27%. In addition, Western Europe, which ranked third in 2015, was surpassed by Russia in 2016, following the closure of the ExxonMobil plant in France in late 2015. Global consumption of butyl elastomers increased at 4.0% annually during 2012–17, and is forecast to grow by about 2.5% annually during 2017–22. The gap between supply (capacity) and consumption has widened, and is forecast to increase further by 2022. China accounted for about 29% of total global consumption in 2017. Exceptional consumption growth of 10% annually was registered in the Indian Subcontinent during 2012–17; Southeast Asia also noted very large consumption growth during 2012–17. 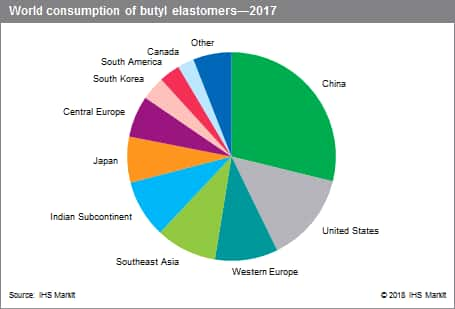 Consumption of butyl elastomers declined in most of the other, more mature markets during 2012–17. The consumption forecast to 2022 projects that the highest average annual growth rates will be for the Indian Subcontinent, the Middle East, China, and Northeast Asia. This growth will be driven mainly by increasing demand from the developing tire industries in these regions. Consumption in the largest market, China, is forecast to grow at just over 3% annually in the next five years, versus higher growth attained during 2012–17. Rather limited demand growth is expected in some of the mature markets such as Western Europe, Canada, the United States, and Japan.